Brooks-Range Mountaineering is a small company that focuses on creating gear for alpinists, seasoned backcountry adventurers, hiking, mountaineering and ski guides, and any other outdoor enthusiast requiring superior quality gear. 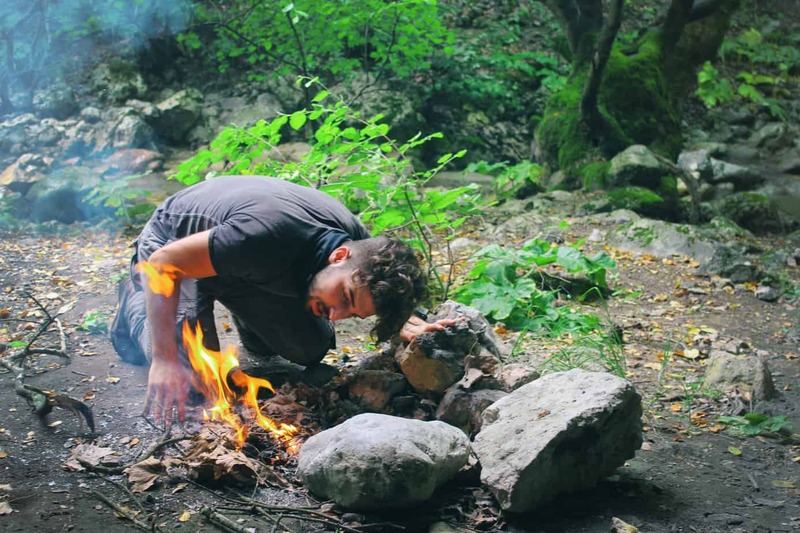 Not only is Brooks-Range gear designed by purpose/activity, but the company also has their gear tested in real life conditions by professionals. Brooks-Range Mountaineering provides a range of different gear and equipment that anyone would love carrying, including apparel, the lightest sleeping bags, snow saws and shovels, and even health monitoring tools like a finger pulse oximeter. As you’d expect, Brooks-Range mountaineering tent is exceptionally well-designed and will provide you great protection. This brand really focuses heavily on tarp-style shelters, but they have a few select tents as well – such as the Propel Tent. The Propel Tent is a no-frills, highly-functional tent that is versatile and easy to use. 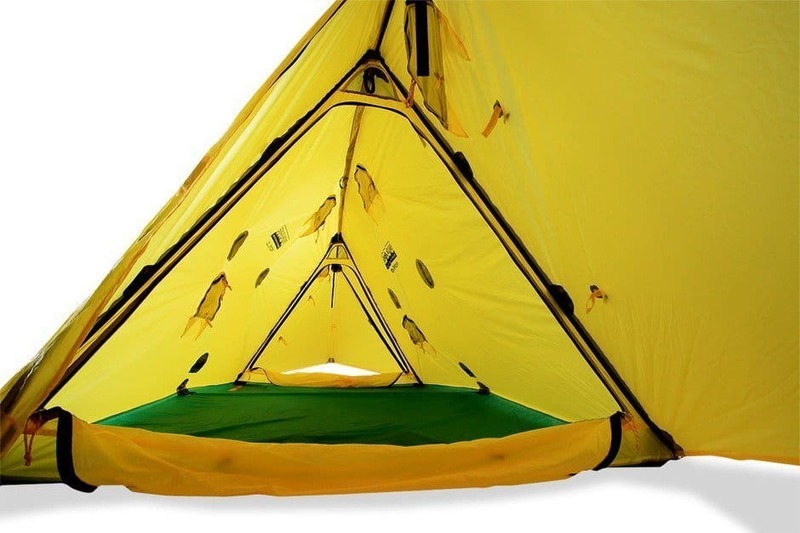 It’s exceptionally lightweight and doesn’t include all the excessive features so common in heavy tents designed for the casual weekend camper or for hiking. Should You Buy the Brooks-Range Propel Tent? Brooks-Range Mountaineering describes the Propel Tent as a 4 season backpacking shelter, and though they don’t specify the capacity, based on the floor area this is best as a solo or 2 person tent. It is designed as a lightweight tent best for overnight or weekend trips, depending on your experience level. Total floor area – 28 sq. ft.
Vestibule floor area – 6.6 sq. ft.
With the details out of the way, let’s get into some reasons why the attractive Propel tent is so widely recommended. There are a lot of reasons customers love the Propel, but they can be summed up in these four major benefits. It’s all too common for 4 season tents to really not be truly capable of handling harsh winter conditions. The Propel is one tent that meets and exceeds what you’d expect in a rather small winter shelter or mountaineering tent. Numerous customers who have put the Propel through the wringer have found that it provides protection withstand winter amazingly well. Even to the point of waking up in the morning and having to dig out of the tent after a heavy snowfall without any damage having been done to the shelter itself. At the very most the Propel will weigh around 3lbs, but chances are if you’re going to be using your own ski or trekking poles the weight will be around 2 to 2 ½ lbs. The Propel comes with its own stuff sack, which will be roughly 5″ in diameter and just over 16″ long. Visually this is about the same size as two 32oz wide-mouth bottles stacked. This tent is easy carrying and lightweight enough that some take it along in their daypacks just in the event of an emergency. The Propel is also ideal for search-and-rescue situations where you may need to set up a temporary shelter for a found hiker that is weak or injured. 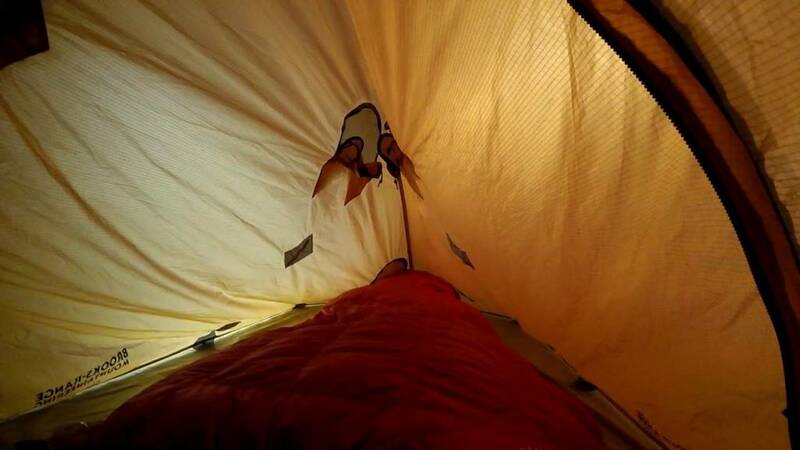 A versatile tent is almost also a more useful tent. The Propel tent is designed for alpine and mountaineering, which means it’s very likely the use is going to be using trekking poles or ski poles anyways. Brooks-Range decided to design the Propel to be erected with 3 different pole options – either the poles that come with the tent or your own ski or trekking poles. This helps to cut down on weight and really helps save space in your backpack. As mentioned, the Propel is a true 4 season tent, so naturally, it can handle weather very well. The Propel is especially impressive when it comes to wet weather. The waterproof tent wall exterior sides are very smooth, allowing water and snow to slip right off without weighing it down but still being a breathable material and avoiding condensation. The tent seams are all taped to further prevent any leaks from potentially occurring. Customers have found this tent to take on heavy downpours of rain, hail, snow, and heavy sleet or rain-snow mix perfectly. You’ll find that the majority of reviews for the Propel are rated 5/5 star. Positive reviews are found across multiple retailers websites, showing that there is unbiased agreement that this is an excellent tent. It’s hard to find a bad review for the Propel Tent, but if you do stumble across one, chances are it related to other of these two potential downsides. There is a bit of a trend in negative reviews from customers over 6′ that the Propel is too small. The peak ceiling height is only 38″, which is often adequate, but that combined with the fairly compact floor space can make it uncomfortable for taller men and women. Extra-long sleeping pads don’t fit well in this tent and some customers ended up having to extend their pad into the vestibule area to make it fit. If you are very tall you might experience the same problems for yourself, so keep this in mind before purchasing. The Propel is a maximum of a 2 person tent. It is a little bit bigger than a solo tent but also fairly small compared to other true 2 person tents. This probably isn’t an issue for couples or friends who are comfortable sharing a small space together, but it might be uncomfortable if you plan on taking this camping with a partner you don’t know well. That being said, there is enough space for two regular sized sleeping pads with a small gap. You probably won’t be bumping elbows unless you or your partner happens to really sprawl out. Chances are the average individual or two people comfortable sharing close quarters won’t find there to be any flaws in the Propel. 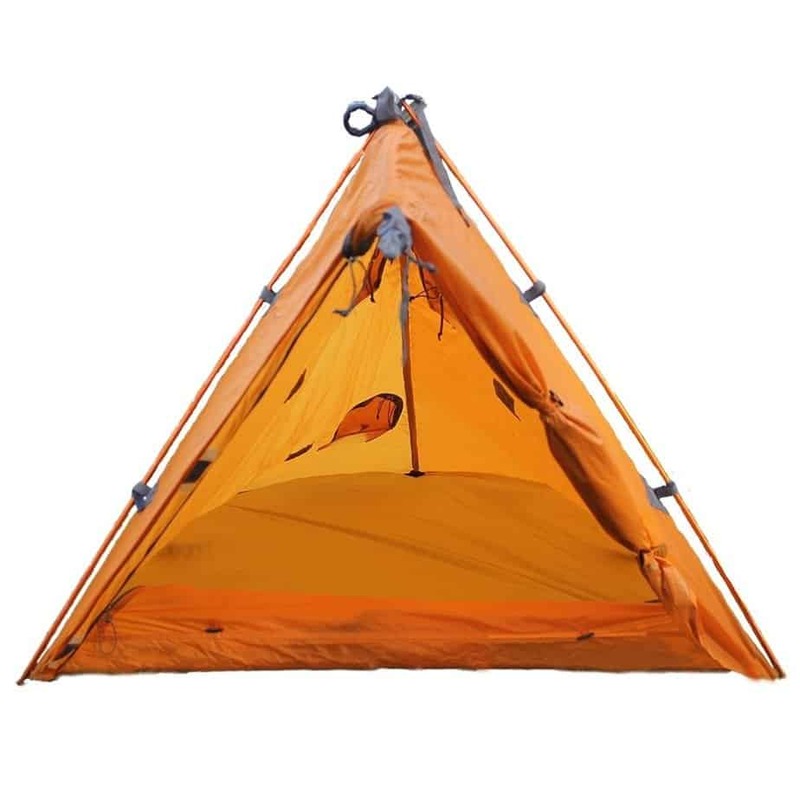 The Brooks-Range Propel Tent is an excellent choice for more experienced backpackers that either need either a lightweight main shelter for alpine conditions or are looking for an emergency shelter that is light enough to carry in a daypack. Although beginner campers can still get plenty of use from the Propel Tent, they might find it a bit sparse compared to big box store tents. Another factor to note is the height of this fairly compact tent. The Propel is most comfortable and lighter for those of average height or shorter. Very tall individuals might find the space to be a bit cramped in terms of height, although it’s no more cramped than other technical-style 2 person tents. The Brooks-Range Propel Waterproof Tent truly is a solid 4-season tent that is plenty comfortable for 2 people. It is highly durable, great stability, very well-designed, high-quality material, breathable and certainly doesn’t need to be babied out of fear of damaging it. The Propel can take a lot of abuse in terms of weather conditions. Its low weight combined with its compact packed size makes it appropriate for light and maybe even UL backpackers needing an alpine tent. If you fall into this category the Propel is well worth purchasing and trying out for yourself.